The bill will double renewable energy use in the state by 2025, require 50% renewable energy by 2030 and 100 percent carbon free electricity generation by 2045. This means New Mexico can quickly transition from dependence on fossil fuels for electricity to joining other states to lead a new clean energy economy. Read more here. largest utility, had already pledged to divest itself of all its coal assets by 2031. In a statement released on February 21, 2019, Mayor Ravi Bhalla announced that the city of Hoboken, New Jersey will begin purchasing 100% clean, nonpolluting renewable electricity for all municipal facilities starting April of 2019. This includes offices and buildings used for the Hoboken local government, such as city hall. Over 200 mayors have taken Sierra Club’s Mayors for 100% Clean Energy campaign pledge. Expanding the use of geothermal resources could help make the goal reachable. RE100: 166 global companies have made a commitment to go ‘100% renewable’. Read about the actions they are taking and why here. 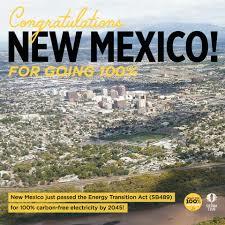 This entry was posted in NewsBlog and tagged Berkshire Hathaway's NV Energy, community solar, Nebraskans for Solar NewsBlog, New Mexico - third state to commit to 100% renewable energy, New Mexico's Energy Transition Act, Public Service Company of New Mexico, RE100, Sierra Club's Mayors for 100% Clean Energy Campaign on March 15, 2019 by Helen Deffenbacher.